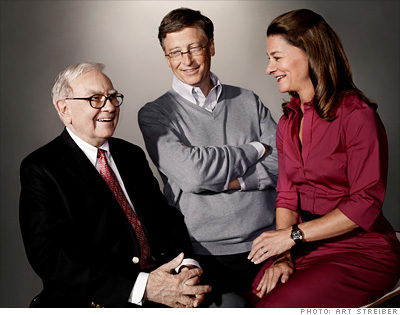 The gurus of twenty-first century philanthropy are Bill and Melinda Gates and Warren Buffet. Between the two of them they have made plans for merging their wealth and creating the largest charitable foundation of our time. This is a good thing. There is a need in each historical period one or more charitable organizations of overwhelming size. Many of the social needs of our time demand large infusions of money from a single organization if the problem is to be overcome or even if it is to be addressed at all. Yet these three are also engaged in another activity which is not such a good thing. They’ve formed a group called www.thegivingpledge.org . The purpose of this group is to encourage all other wealthy people to give a majority of their assets to charitable purposes either during their lifetime or at the time of their death. As of April 2013, 105 billionaires have signed the pledge. There is a huge and growing economic and social danger in encouraging these wealthiest of individuals to place so many more billions, even trillions, of dollars into the charitable sector. Especially when so many hundreds of thousands of other – not quite so wealthy – people are placing an aggregate of additional billions in the charitable sector at the same time. The idea of unlimited charitable contributions was a very salutary and most excellent principle throughout the twentieth century. Why is this same patently good thing not so great in our current times? In this series I will first describe the problem in as dramatic a way as is possible when discussing accounting principles. Then I will offer alternatives to charitable giving; and in these alternatives you will see the new direction I am attempting to take charitable givers. The danger is that the non-profit sector of the economy may grow so large that it will impair and erode the ability of the overall profit-making and individual enterprise share of the economy to function in the way that capitalism was designed to function. All these massive new infusions into the non-profit sector will soon be competing with the private sector, eroding the tax base (non-profits are not taxed), and making it difficult for the individual to succeed unless he attaches himself passively to either the government sector or the non-profit sector. As a first thing to look at, note that the rise in the size of the government sector is legitimate yet excessive, and needs to be controlled and limited just the same as the non-profit sector. Let’s look at the numbers. I think we will all agree that the government sector of the economy is not engaged in private enterprise except when contracts are let to private companies. The government sector also pays no taxes on its income, assets or other revenues. Right now about 26 per cent of the overall economy is in the federal government sector. When you add the state and local government sectors the percentage could go as high as 36 to 40 percent of the overall Gross Domestic Product (GDP) which is not engaged in private enterprise or paying taxes. The below chart shows one person’s estimate of government spending. 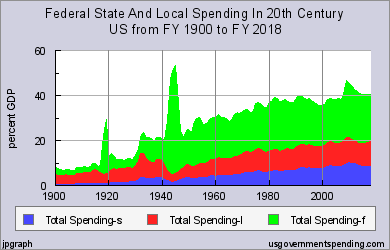 The term “f” means federal spending; the term “l” means local government spending; the term “s” means state government spending. I cannot vouch for the accuracy of this information or these statistics. It is true, though, that many thoughtful people are very concerned about the growth in overall government spending and want to do as much as they can to either stop the growth or shrink the percentages. As the percentage of the GNP in the government sector grows, the economy becomes more of a mixed socialist state and less of a free-market capitalist state. So if we add the government spending numbers to the volume of the economy in the non-profit sector, then the portion of the economy in the free-market capitalist sector declines even more. As we will see as we go along, the non-profit sector is absolutely not a part of the free-market economy, and presents challenges to the continuation of our capitalist society. This reported figure does not include all non-profits, and includes almost none of the religious non-profits, which are not required to report to anyone. For this computation I have abstracted the assumption that combined religious organizations, including churches, have revenues of another 33 percent, another half-trillion dollars; for a grand total revenues of about $2 trillion dollars in tax-exempt non-profits of all kinds. This addition brings our total percentage of the GNP in the non-profit sector to about 13.3 per cent of the GNP. When combined with the government sector, the total revenues come to at least 49.3 per cent of the GNP. Such an exalted ascension of the charitable sector at the present time in history thus threatens to undermine the profit-making sector and individual enterprise, which is at the core of what has made America great. I offer the example of England. In the Middle Ages there came a time when charity was so exalted that the church ended up owning as much as a third of the property in the country. Gradually the rulers began to realize that such non-profit, non-taxable ownership was sapping the will of those who would grow the economy and those who would labor as well. The property and money given to the church was permanently in the hands of the church and could not be sold or transferred to anyone. There was no way for individuals outside the charitable sector to either gain ownership by purchase, or to pass on such property to the next generation by way of descent. Such property in the end became a “dead hand” on the economy of the nation. This problem became known as “mortmain,” and became abhorrent to those who knew that the growth of the nation depended on the free transfer of assets and by passing on assets to the new generation. In English law, the state of land being held by the “dead hand” (French: mort main) of a public entity or charitable group, became an important condition to limit and control. In feudal days a conveyance of land to a monastery or other public entity deprived the lord of many profitable feudal incidents, for the public entity or other charitable group was never motivated to sell, was never a child or an adult, never died, never committed a felony, and never married. Statutes were consequently passed between the 13th and the 16th century seizing many mortmain assets and prohibiting the transfer of land or other assets into mortmain without license from the crown. Modern English law is contained in the Mortmain and Charitable Uses acts, 1888 and 1891, and in a number of acts that authorized some non-profit companies and some other entities to hold land without license in mortmain. An unauthorized conveyance into mortmain made the land liable to forfeiture to the crown. This mortmain law is very similar and yet much more restrictive than the current US law which requires that a charitable organization register with the Internal Revenue Service and be granted a license to engage in non-profit, non-taxable activities. In fact the current American laws are so lax that almost anyone can create a non-profit, non-taxable entity, as long as they fill out the forms using the right catch-phrases and recitations. The Internal Revenue Code describes approximately 30 types of tax-exempt organizations. Examples include universities, hospitals, charitable organizations, social welfare organizations, religious activities, labor unions, trade associations, fraternal societies, and certain types of political organizations. There is a great deal of heft in the tax-exempt portion of the economy. Mind you, I do not intend to come across as being against public and private charity. Many non-profits have been a part of what have made our country great. Other non-profits have reached out to the world and helped to correct problems which government and private enterprise could not address. I am solely addressing the current twenty-first century trend toward all the wealthy giving a majority of their assets to the non-profit sector, and the unchecked growth of the non-profit sector, and the effects of such growth on the economy of the nation. Such unchecked growth is a valid twentieth-century phenomenon, which promises to throw the economy out of whack if the concept is not adjusted to account for present conditions here in the twenty-first century. There will eventually be a high price to pay in the ascension of the mortmain “dead hand” as a portion of the economy. Right now about 13.3 per cent of the GDP is in the non-profit sector; non-taxable and non-transferrable. Also, right now approximately 36-40 per cent of the Gross Domestic Product (GDP) is in the governmental sector at all levels. This property and revenue is not subject to taxation, and cannot be transferred at will in and out of the private sector. I consider the government, however, to be just as much a “dead hand” as the non-profit sector, as we have defined it. This means that at the present time at least 49.3 per cent of the GDP of the United States is currently operating under a “dead hand.” It cannot be taxed, and cannot be transferred at will in and out of the private sector. This large proportion of the economy of our country is entirely outside the reach of the private sector, and cannot really contribute to the advancement of capitalism except as it spends money to hire people and buy services from the other 66 per cent of the private economy. Sources of these statistics are the Urban Institute, National Center for Charitable Statistics, Core Files (1998–2008); the Internal Revenue Service Business Master Files, Exempt Organizations (1998–2008); and “The Nonprofit Sector in Brief:” Public Charities, Giving, and Volunteering, 2010, Kennard T. Wing, Katie L. Roeger, and Thomas H. Pollak; “2011 Index of Economic Freedom,” by The Heritage Foundation. So right now our private capitalistic economy really has an input over only about 50.7 per cent of our total Gross Domestic Product. As a direct result, the private sector is becoming more and more dependent on the “dead hand” portion of the economy to create income and profits. People must passively find work within the “dead hand,” and become dependents within the economy, rather than entrepreneurs or individualists. Can I just say what a relief to seek out somebody who actually is aware of what theyre speaking about on the internet. You undoubtedly know learn how to deliver an issue to gentle and make it important. More people have to read this and understand this aspect of the story. I cant imagine youre no more popular since you definitely have the gift.